On Tuesday, we attended a master class given by Renée Fleming as part of Marilyn Horne's The Song Continues series at Carnegie Hall. 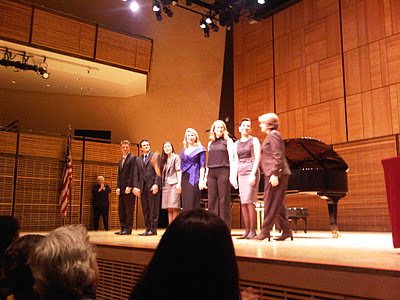 In about an hour and a half, Renée worked with four students: Dusica Bijelic, Soprano, Melissa Shippen Burrows, Soprano, Nathalie Mittelbach, Mezzo-Soprano, and Marco Stefani, Tenor. Each student performed a piece and then Renée worked with each for about 20 minutes each. She mostly spent time focusing on breathing techniques, although she did hit on a few phrasing issues and body carriage. Renée is as entertaining as a teacher as she is a singer. She's unbelievable smart and it was interesting to hear her impart her knowledge. She kept the audience in the loop, even giving us tips and asking our opinion on progress of each student. While most of the audience were clearly just spectators and those who love the sport of classical singing, there seemed to be a small minority of students in the audience. I was also reminded of how funny Renée is: when she was working with Dusica, she asked her to turn her back to us to lean against the piano to get the sense of the pressure of breathing. Dusica, who is lovely and very slender, turned back and apologized to us, "I'm sorry." Renée got a huge laugh when she also turned back to the audience and retorted, "I'm more sorry." It was so funny! But of course, Renée looked fabulous in her chic outfit. Each of the singers were lovely and a good indication that we're in for a treat in the future. While they are still studying, they have also had a degree of performance experience. Dusica has just been accepted in to the Royal Opera Young Artists Program. She performed Hugo Wolf's Kennst du das Land, with text by Goethe. Renée commented that she learned worked on this piece extensively when she was a Fulbright Scholar in Germany. Nathalie performed Reynaldo Hahn's Quand la nuit n'est pa etoilee, text by Victor Hugo. This was my favorite piece of the evening. Renée again worked with Nathalie on breathing and holding her body properly. She found a much more beautiful sound and this was my favorite performance of the evening, of course, I'm a little partial to Hahn. Nathalie is currently a second year graduate student at The Julliard. Marco performed Franz Liszt's Pace non trovo, text by Francesco Petrarca. Renée worked with him on performance and phrasing. He improved in imparting the feeling of the heartbreak of this song. Marco received his master's degree in music from Indiana University. Melissa has earned her master's degree from Julliard and has performed extensively regionally, as well as with the Deutsche Oper Berlin. She was clearly the most polished of the quartet, vocally and performance wise. She was dressed elegantly as well. She performed Rachmanifoff's Vesennije vody, text by Fyodor Tyutchev. Even with her experience, Renée coached her to lose a little of her dark sound and attempt a little bit more beautiful sound. It made a lovely difference. It was interesting seeing Renée correcting the tiniest thing - holding their shoulders up and hunching. I find myself doing this so I think I'll be more conscious of this. Renée talked about the way a singer holds themselves when they are performing - upright, relaxed, presentational. She mentioned Tyne Daly's recent portrayal of Maria Callas in Master Class on Broadway and how she captured how a singer should look. Renée commented that these were all just small things for these singers to take with them and hopefully wouldn't confuse them more. She also commented that young singers should sing the right repertoire for their age and voice. The young pianists accompanying were Saule Tlenchiyeva and Brent Funderburk and were both fabulous in performance and in following along with the teaching. Marilyn Horne opened the evening with her introduction of Renée. In 1994, Marilyn founded the Marilyn Horne Foudnation, dedicated to the art of the voval recital and presentation of younger singers. In 2010, the foundation's programs became a part of Carnegie Hall's Weill Music Institute. At the end of the evening, an audience member asked Renée about advice she had received. She recounted her story that when she was at the Met singing in Ghosts of Versaille, she approached Marilyn Horne and told her that people had been telling her that she should sing Norma. Renée mimiced Marilyn's response, "Oooooh no, no, no, no." It was a lovely and educational evening. As a former choir member and sometime musical theatre performer in my younger years and now a devotee of performance of the voice, it's very interesting to know a little about the process of what makes this beautiful sound.